Mazzer Super Jolly Grinder with timer. 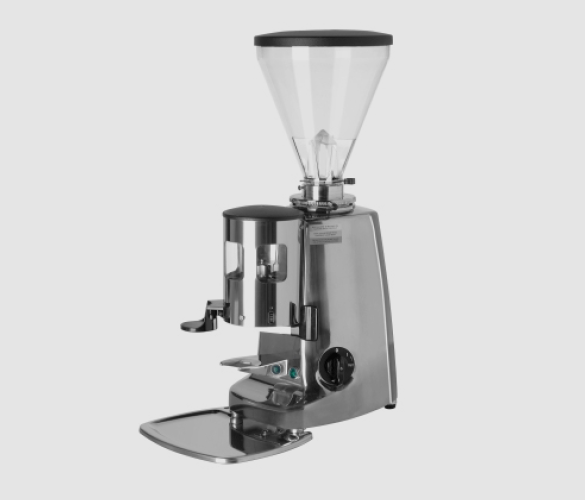 This Mazzer Super Jolly product is a premium grinder-doser that delivers high-quality and consistent results. It can be used for home or business use and is suitable for medium consumption. The stylish design and innovative features make this product a must have for any coffee fanatic. Preserve the coffee oils. Once grinded, coffee starts to produce oils and aromas that can be affected by conflicting smells. Doing this process at home minimises the exposure of the oils so that it can maintain its freshness and full flavour. Avoid moisture. If grounds are exposed to moisture in the air, this can diminish the oils present in your coffee and affect the taste. Experience the aroma. There’s really nothing like grinding your own beans at home. It allows you to fully appreciate a coffee and experience the delicious aromas it has to offer. Protect the flavour. Beans have almost 1,000 different flavour and aroma molecules. Once they are grinded, these molecules start to be released into the air rather than going into your cup. The shorter the length of time they are exposed to air, the less flavour molecules that are released. Have more control. At home you have complete control over the process, compared to someone else doing it for you. You control how you grind, what size you use and how much coffee you want. Mazzer has been producing professional grinders since 1948 and are highly specialised in the industry. They are a company that continuously provide premium products and coffee devices that you can rely on. All of their grinders are produced in Gardigiano di Scorzè and are only shipped from here once they are certified for quality and reliability. Mazzer pays maximum attention to detail throughout their whole production as durability and reliability have always been their main focus alongside innovation. The grind size plays a huge role in the final taste of your cup. There isn’t a one size fits all, as depending on which brewing device your using will determine what size you should be using. Of course, it can also depend on personal preference. One person may prefer coarse for a French press, whereas someone else might prefer medium.